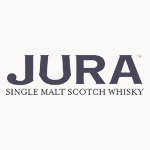 Jura distillery is located on the island of the same name, neighbouring the Caol Ila stretch of water, which runs between the island and Islay. Despite a distillery being located on this site since 1810, Jura distillery did not produce whisky until 1963, when the new building that can be seen today was erected. With a population of only 200 people, the distillery was originally built to boost the economy of the island. Despite the closeness to Islay, Jura whisky is not renowned for the intense smoky and peaty flavours of its neighbour, due to its different distilling techniques. George Orwell famously visited the island to write his novel â€˜1984â€™ and this was celebrated with the release of a special edition 30 year old expression in 2014.